Tia Mowry-Hardrict just added a new baby girl to her family. But that’s not the only gift she’s given birth to this year. She’s adding a new movie, Indivisible, to her portfolio as well. In an exclusive interview, Mowry-Hardrict talks about her upcoming role in Indivisible, a true story that sheds light on Iraqi war vet Chaplain Darren Turner as he returns home to struggles that threaten the strength of his family and faith. “What attracted me to this movie is that it honors military families and their home life,” says Mowry-Hardrict who was born in Gelnhausen, Germany, and grew up in a military family. Her mother, Darlene, is a retired US military veteran who rose up the ranks to become a Drill Sergeant. Her father Timothy is also a retired U.S. military veteran who trained soldiers for the Gulf War. “I dealt with everything in the army right in my backyard,” she says. As a teen actress, Mowry-Hardrict became a role model for girls everywhere as the smart and focused Tia Landry in the sitcom Sister, Sister. Now, she’s taking on the role of Tonya Lewis, a military wife who has to deal with the emotions and challenges war can create in a family. She continues to evolve in her career because of the lessons her parents instilled in her. Mowry-Hardrict believes that the key to longevity in the entertainment industry and any path you take in life comes down to authenticity. The roles she has played represented characters or situations that she could relate to in real life. For example, she played the role of madly-in-love medical student Melanie Barnett on the TV show The Game. In this show, Melanie marries her long-time boyfriend Derwin Davis. Mowry-Hardrict had practice walking down the aisle at the time because she experienced her real-life wedding in 2008 to husband Cory Hardrict. 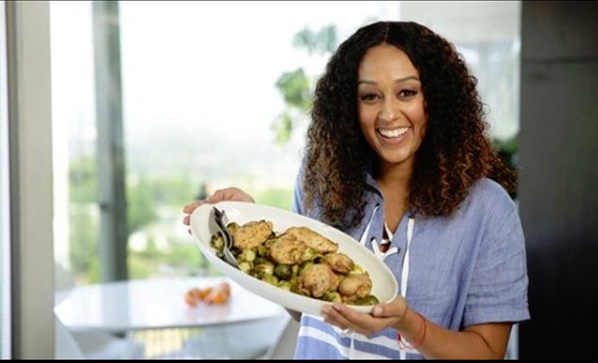 “Life imitates art and art imitates life so wherever I am in my life, I gravitate toward that.” Now that Mowry-Hardrict’s family has grown, cooking has become a part of her daily routine, which is seen on “Tia Mowry at Home” Cooking Channel show. All of Mowry-Hardrict’s experiences have prepared her for the heart-wrenching, powerful story told in Indivisible. She’s excited to return to the big screen in October in a role that allows her to focus on family and marriage, and give thanks to the military.